Crafts4Cats | Writing Essays: Hard or Easy? Writing Essays: Hard or Easy? If you’re like me, you have had to write essays for a school project before, and in eighth grade, it’s destined to get worse. If you’re like me, you are also in love with the Broadway play, Hamilton. 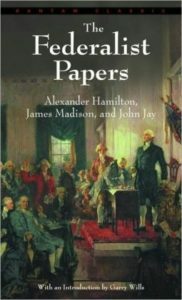 In the play, one song (‘Non Stop’) says “Alexander joins forces with James Madison and John Jay to write a series of essays defending the new United States Constitution, entitled The Federalist Papers. The plan was to write a total of twenty-five essays, the work divided evenly among the three men. In the end, they wrote eighty-five essays, in the span of six months. John Jay got sick after writing five. James Madison wrote twenty-nine. Hamilton wrote the other fifty-one!” That means, using math, you can find that Alexander wrote an average of two essays a week, or one essay every three and a half days. Writing seems pretty easy for Hamilton, making us students wish for his writing ability. So how did he do it? How did he write so fast and so well? In the book, The Federalist Papers, (sold at Books A Million, if anyone reading is interested) it says that Alexander Hamilton was practically obsessed with getting the U.S Constitution in action. As a student, I know that it isn’t always an option to really care about the topic you are assigned, so I suggest finding something cool about it or making it funny. If you get a chance to choose your essay topic, find something that is a bit of a challenge but fun or cool to write. Never put it off until the last minute. I know this sounds like something your teacher would say and you would ignore, but trust me, finish your project as soon as possible. It reduced your feeling of stress to get the project done and if you’re lucky, you might even finish far before the deadline and have some time to relax before it’s due. If you find anymore tips and tricks on how to write an essay like Alexander Hamilton, type them up in the comments. Also, comment any blog post ideas you would like to see my opinion on. See ya later marshmallow bunnies! Sorry for the delay of blog posts! I have been in Freeport Il on mission trip for a week and continued to take a break from my work for the two weeks following my return. Reply to this comment using the code word “story” if you want to hear what I did in Freeport! Part of the reason Hamilton was able to write so proficiently and quick is that he had been in many late night conversations over beers with Washington, Jay, Adams, Jefferson, Burr, Lafayette, and Thomas Paine from basically 1770 (before the revolution) through the Declaration of Independence, through the revolution, through the years of the Articles of Confederation, until the Constitution was written in the late 1780’s…a period of nearly 20 years. He didn’t have to research anything…these were essentially blog posts of views he had been discussing and forming for that 20 years. These topics were not authoritative, but only became authoritative because he was so committed to writing these ideas down. There were many people opposed to the Federalist point of view. Had they been nearly as persuasive, our government and our country would be a very different place today. It has to be beer. Not coffee, tea, or any other beverage. Only coffee.